Site preparation is a fundamental component in construction as it is literally the foundation for the rest of your project and has everything to do with remaining on time and on budget. Basics can include debris removal, even tree removal in order to proceed with grading or re-sloping the land. Soil relocation and leveling; berms for landscaping; house pads, driveways and curbs; curtain drains to draw liquid away from the home are just some of the aspects of site preparation. Excavating contractors are prepared to handle these and many other projects utilizing today's technology , machinery and the personnel to handle the job. Excavating contractors are also used for performing underground utility work having to do with power and telecommunications; trenching for gas and water lines and any other sub-surface utility installation. Trenching work extends to the installation of storm sewer drain lines, sanitary and water lines as well as storm sewer collection, pumping systems and waste water treatment. Whether it is septic installation or repair or on-site waste management installation or repair, excavating contractors are prepared and ready to take on the specialized needs of many projects that require the expertise to carefully plan, prepare and perform the work that so many depend on to be done correctly and to last over time. General applications of excavation work involve earthwork, or earth moving. Grading of land to reconfigure the topography or to stabilize slopes requires the removal of materials as light as debris to as complex as demolition in order to remove obstructions. Brush clearing as a routine chore can also be handled by excavation contractors as they are already equipped for such work. Construction equipment associated with excavating is typically heavy equipment due to the amount of material being moved which can amass to millions of cubic yards. The skip loader, or bucket or front end loader, is a tractor fitted with a front mounted wide bucket to scoop up loose material. The grader is used to create a flat surface and the wheel tractor scraper is used for earth moving. Bulldozers are used to move earth while backhoes are used to move trees or stumps. The backhoe has stabilizers it can deploy to prevent tipping as it uses its strength and power as leverage to pull out heavily entrenched elements such as tree stumps. 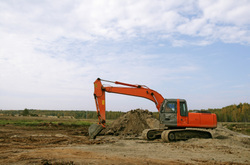 Excavating contractors are also responsible for feature projects such as ponds and other water treatment features. These projects can be completed using the customer’s designs or by providing designs and result in the most enjoyable aesthetic enhancements to properties or landscapes. Other services excavating contractors are prepared for include removing junk, appliances or building materials, trash and landscape debris. Dumpster rentals can be obtained through excavators typically used while performing major clean-up during remodels. Recycling certainly can be accommodated as consumer waste can be easily picked up. Excavating, as it is defined, involves removing materials or making a hollow or cavity. Archaeologists excavate a dig to discover the past and retrieve artifacts to preserve history, and miners excavate to extract riches from deep inside the earth. Excavating is also a critical step in construction. Whether it is new build, remodel or restoration; underground work, installations, rehabilitations, maintenance or renovations, the basis of any good project that is to last over time and avoid problems such as settling must begin with a good foundation.